ATOS is nearly totally dependent upon members for sponsorship and underwriting of the organization’s program activities. ATOS membership is open to everyone who shares an interest in the preservation and promotion of the theatre pipe organ. Members may have an interest in listening to or playing a theatre pipe organ, or they may be interested in the technical aspect of this complex machine -- how does it work? Other members may have a particular fondness for the magnificent theatres that house these glorious instruments. 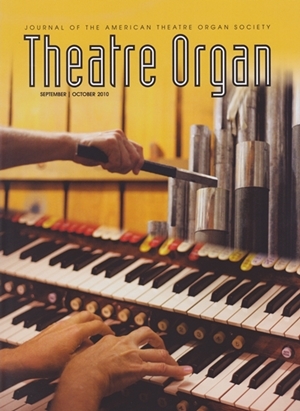 ATOS membership includes the bimonthly publication THEATRE ORGAN (pictured to the right), the Journal of the American Theatre Organ Society, providing reviews and informative articles focused on past and present theatre organ related activities. The ATOS Journal includes directories and other factual articles focused on documenting and teaching various aspects of the theatre organ. Membership also includes the opportunity to attend various regional, national, and international conventions and special events. Hundreds of theatre organ aficionados congregate at these gatherings to hear and see theatre organs and great performers in various locations. There are several categories of membership available to allow individuals the opportunity to support the American Theatre Organ Society. Donations above the regular and student membership rates are tax deductible. Individual members make the ATOS a successful organization. In their own words, here is why they join. "Until recently, the thought of my attending an organ concert was very remote. I just didn't care to sit through an entire concert of such music – or so I thought. That was before I attended a concert performed on a majestic theatre pipe organ. The program included jazz, the classics, Broadway melodies, and more. My wife and I found it to be a spellbinding experience. It was a night to long remember." "The ATOS journal, Theatre Organ, has given me the chance to find recordings of organs and organists that I could never find before." "Wonderful concerts, excellent technical seminars and lots of good fellowship with other organ lovers." "I can't think of a better evening than the one we had watching Phantom of the Opera accompanied by the Paramount Wurlitzer." "Our recent trip to England included visits to many spectacular theatres, but it was most memorable for the good friends and the good times." Also note that you can renew and pay your dues online as well. Use the same links for joining ATOS. Membership in local chapters provides many ways to become actively involved. Chapters have theatre pipe organ installations and hands-on opportunities for playing or working on instruments are frequently available. Chances are good that you will find a chapter in your region. Click to FIND A CHAPTER NEAR YOU.